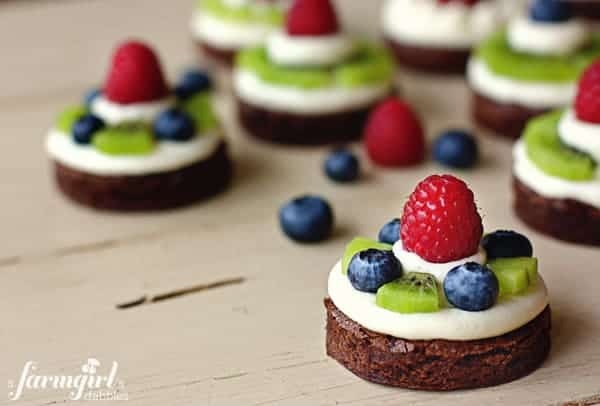 After having so much fun with the brownie heart sandwiches for Valentine’s Day, I decided to make Fudgy Mini Brownie Fruit Pies with Almond Cream Cheese. And I just happened to do a test run on March 13th, the day before Pi Day…which turned out pretty well for Hatti’s classmates when she brought in these mini brownie fruit pies to celebrate Pi(e)! These brownies are fudgy and delicious, everything a good brownie should be. We topped them with almond (one of Hatti’s favorite flavors) cream cheese and fresh fruit that Hatti hand selected from the grocery store. They make just the most perfect birthday treat! Hatti, ready to move into “double digits”! How can it be that our little girl is already 10 years old?! What a joy you are, Hatti girl. Use any whole or cut fruit that you like, just be sure it’s fresh, tasty, and beautiful! Fold a long piece of heavy foil into a 13″ wide strip and fit it inside a 9″ x 13″ metal baking pan, leaving foil overhang on the 2 long sides. Spray the foil with nonstick spray. Stir the butter and chocolate in a large heavy saucepan over very low heat until chocolate is melted. Remove from heat and whisk in the sugar, and then the eggs, 1 at a time. Whisk in espresso powder, vanilla, and salt. Then sift the flour over the chocolate mixture and stir to blend well. Transfer batter to prepared pan. Bake brownies until slightly puffed and dry-looking and tester inserted into center comes out with some moist batter attached, about 20 minutes. Let cool completely in pan on rack. Beat together the cream cheese and butter until light and fluffy. Add almond extract and beat to combine. Slowly add sifted powdered sugar, beating well to remove any lumps. Using a pastry bag fitted with a large plain round tip, pipe almond cream cheese onto each brownie round. I did a little bit of this and a little bit of that…just pipe it on in the design(s) of your choice. Use both whole and cut fruits, depending on size. Decorate in the design(s) of your choice. Brownies recipe was heavily adapted from one of my very favorite brownies, a recipe originally from Bon Appetit magazine, July 2009. I love the addition of the almond cream cheese! Such a nice twist! And these make a gorgeous presentation! I’m sorry to hear about your experience with these brownies, Megan. I’m really not sure what the matter could be. 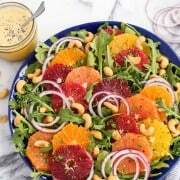 This recipe is one that I make, in different forms, almost monthly. I have never once had an issue with it. I do hope you’ll give it another try. These was the cutest idea ever! And I had to try them! I made them the day I saw your recipe! Thanks so much for the wonderful idea, they are great for parties and desserts; they taste amazing! 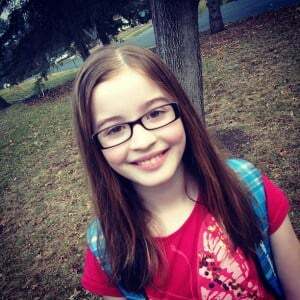 Thank you, Maya – I’m so happy you liked them! What a creative and delicious idea! Sounds like the test run went well – thanks for sharing the great recipe! Happy birthday Hatti – looks like you had some tasty birthday treats! Happy birthday to Hatti! These treats seem like a wonderful way to celebrate such a special day. They look so decadent and fruity-tuity – a wonderful combination! Happy Birthday to Hatti! She clearly has inherited her mom’s excellent taste buds! These look so adorable I want to pick one from my screen! They look and sound like a dream! The added fruit to these pies, make it reasonable to have for breakfast right lol – -these are stunning!! I love them, and I know they will certainly be make soon!! The added fruit to these pies, make it reasonable to have for breakfast right ;) lol – -these are stunning!! I love them, and I know they will certainly be make soon!! 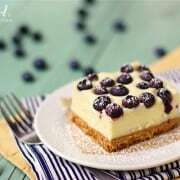 Your recipes always look so beautiful and delicious! 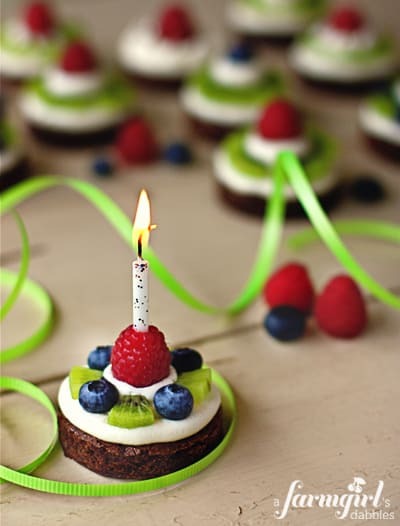 These look just fabulous- awesome birthday treats for a special birthday! My middle daughter turns 10 in a couple weeks, I know she would love those too! Thanks for sharing!! I remember turning 10. It was a big moment for me :) Your little girl is so pretty, and she will get prettier each year. Man, I feel weird saying this because I’m only 8 years older, but still, it’s the truth. 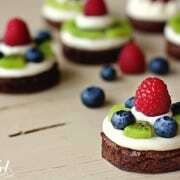 These mini brownies look amazing. 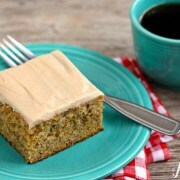 And the sound of almond cream cheese frosting has my mouth watering. I love the taste and smell of almond! They grow so fast, it’s killing me!!! She’s gorgeous, and so are her birthday treats! I know! I obviously want to see our children grow and thrive, but a part of me wants to just make time stand still! Thanks, Julia. You’re so right, Cindy. These are incredibly versatile. I already have a couple events I’m planning to use them for again. Hope you and your mom like them! I want these for MY birthday!!! Happy Birthday Hattie! You are a beautiful girl with a smile that can light up a room (and a blog post). 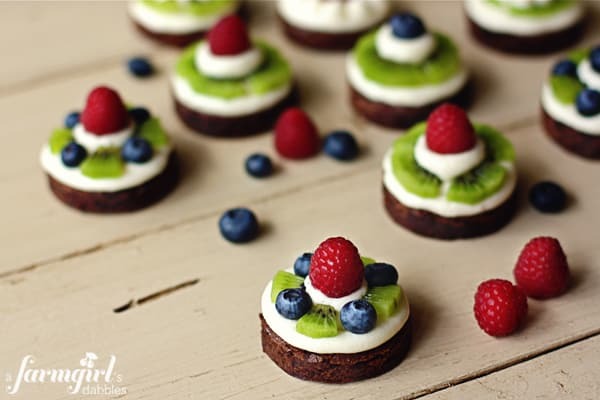 I love your Mom’s brownie fruit pies and I think they are the perfect dessert for a very special birthday celebration. Thank you, Harriet! So is “Hatti” a version of Harriet that you actually use? My grandma’s name is Henrietta, which was not why we named our daughter that, but knew that “Hatti” was a spin-off of Henrietta. That is so strange, I was named after a Henrietta as well! My mothers grandmother. I don’t use ‘Hatti’ but my friends have been known to call me ‘Hatty’ in the past but mostly Harriet. Or of my housemate has his way ‘oi Hazza!’ ha! What a special treat for Hatti. Doesn’t surprise me that she remembered the fruit pizza! The Brownie Fruit Pies are so colorful and yummy looking. Makes me hungry just looking at them. We’re planning to make them again when you come to celebrate birthdays, yay! I love the look of these! I want to try to make them soon! So cute and delicious looking! What are you making for my birthday?! :D By the way, almond cream cheese topping is the best idea I have heard in quite a while. I love brownie fruit pizza but these are adorable being sing-servings. And I bet that almond cream cheese is tasty. Sure is tasty! I love almond flavoring along with fruit and chocolate…this recipe ties it all together. Yum! Happy birthday, Hatti! She is so sweet! I would love these for my birthday, Brenda, I love the fresh fruit! Those brownie pies are just beautiful, and they look incredibly delicious, too. Happy birthday to your sweet girl! Thanks, Natalie, I passed along your birthday greeting!